Grotamar®82 is a registered trade mark of Schulke & Mayrr GmbH Germany. How much Grotamar 82 do I need? Can I use Grammar 82 in conjunction with other fuel additives? Whilst Grotamar® 82 is generally suitable for use in a wide range of fuel applications, the manufacturers can not possibly investigate its compatibility with all additives on the market, therefore their advice is to use caution and try to avoid use with other products. If you wish to test compatibility remove fuel from your system containing the other additives in question into a small fuel compatible container. 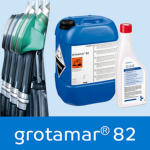 Add Grotamar® 82 to the isolated fuel sample and observe the fuel for any over a suitable time scale before adding to the fuel in the system. Are there any problems I might encounter when using a biocide? After a contaminated fuel system has been treated with an effective biocide, the microbes present will die. The microbes dead bodies will persist in the fuel system and fall off any surfaces where they have been growing into free suspension in the fuel. Therefore it is important that post biocide treatment , settling sludge should be removed from the system. For ships it is therefore very important to carry sufficient filters to enable filter changes should it be necessary until all the sludge is removed from the system. Where a large amount of sludge is known to be present in systems, it is advisable to remove this before treatment as biocides are unlikely to penetrate sludge layers.